The Bermuda 3 is designed for busy bistro bars and cafes. These stands can be used inside and outdoors. Finished in a high quality Matt Black. Held in stock for a lead time of roughly three to five days. 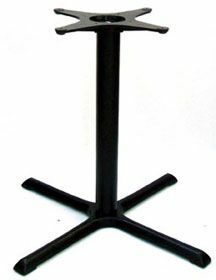 Well manufactured table base with a widespread four foot base and sturdy column. Constructed from black cast iron this base is available for stock release.